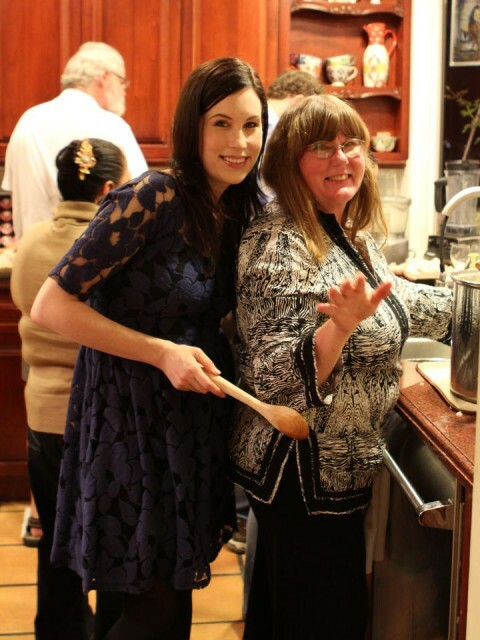 This is what a Shiksa in the Kitchen Thanksgiving looks like! I thought I’d share a few pictures from our holiday gathering last night. We had about 30 guests, so we had to tent part of our back yard and set up a really long table. I took my Sukkot decorations out of storage (many of them conveniently double as Thanksgiving decorations), and handed them to my Mom and my brother’s girlfriend. They are both very handy with this sort of thing, so they worked their Martha Stewart magic while I cooked. The multi-colored water goblets were a birthday gift from my mom a few years ago. Amazing, right? I love having a rainbow of colors at my holiday table. 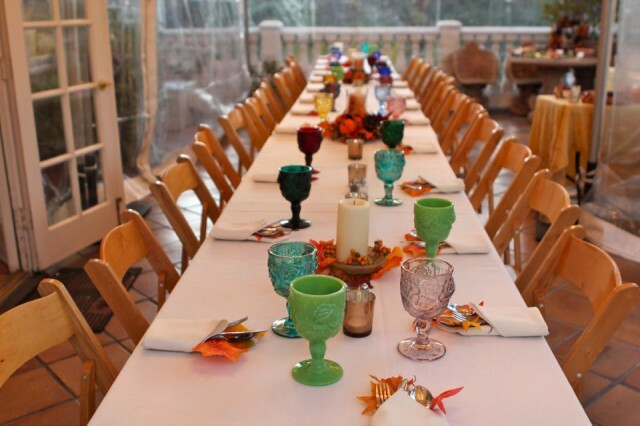 These goblets make an appearance at Passover and Rosh Hashanah, too! That’s me and my mom in the kitchen, cooking up a storm. Mom made her famous mashed potatoes and gravy. Awesome. 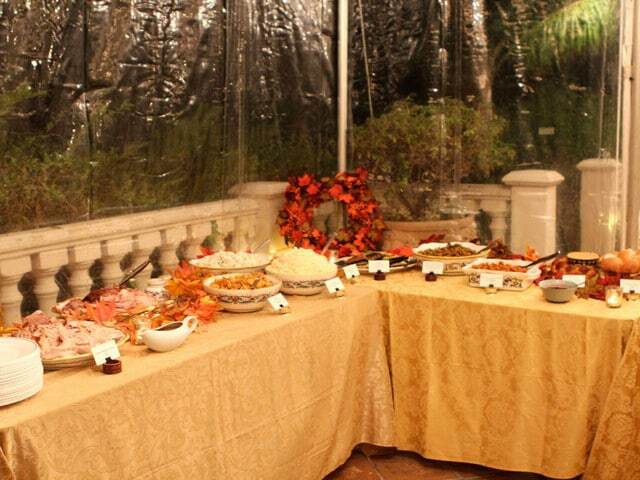 Here’s the buffet, all set and ready to be devoured! I only got a few pics of this, everybody was so hungry that I couldn’t make them wait while I take my food-bloggy pics. The food smelled too good, and everybody was too hungry. 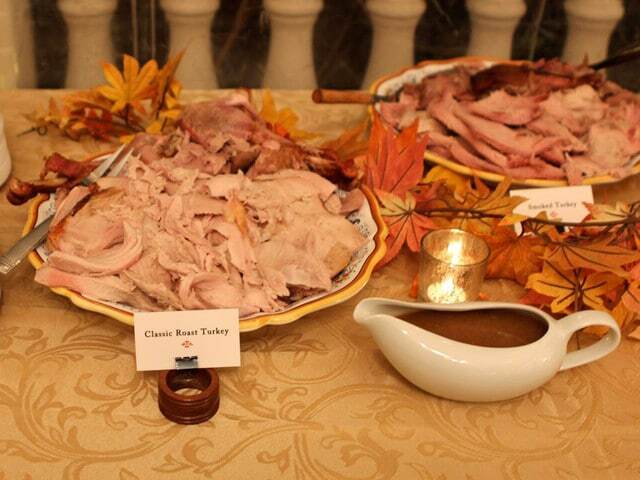 We served two types of turkey, a brined Classic Roast Turkey and a Smoked Turkey. I served lots of different sides, and I tried to work some healthy and exotic flavors into the mix. Thanksgiving is all about tradition, but I like to add a few unique touches– like Moroccan Carrot Salad, Pumpkin Challah, and Smoky Roasted Cauliflower. 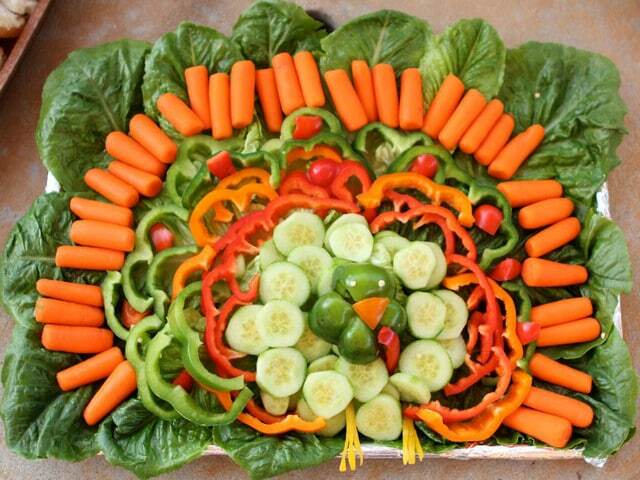 My Mom created this work of art, a veggie tray in the shape of a turkey. We were inspired by a Pinterest post from Jaden at Steamy Kitchen, who pinned the image from EatingWithFoodAllergies.com. Isn’t it adorable?? Gobble gobble! It was so wonderful to share this holiday with so many family and friends. I was born on Thanksgiving (the holiday falls on my birthday every 7-8 years), so it’s a particularly meaningful day for us. My mom calls me her little Butterball. It gives new meaning to the phrase, “I’m thankful to be alive.” What a blessing to be able to celebrate with our loved ones. Hope you all had a terrific holiday! Hi Tori – I viewed this earlier and didn’t leave a comment. I’m back to say: Awesome! Love your table, and pining after those goblets. Lovely picture with Mama! and the food as always re-yummm! What a spread …both food and love…We had a long table and lots of people as well but not as long as yours …love the colorful goblets. They make it festive. 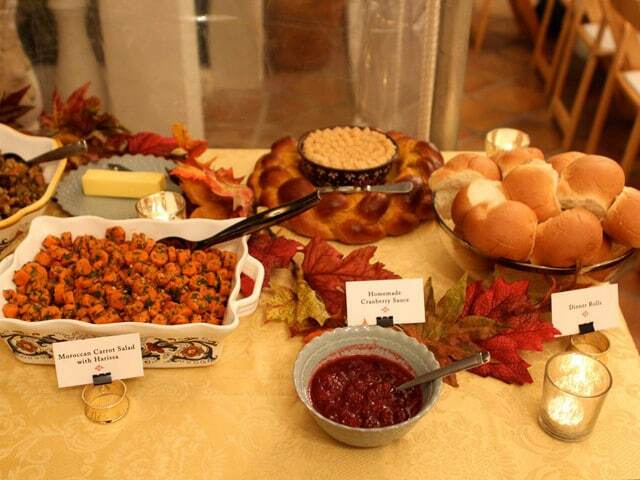 What a beautiful table and spread! Yes, it helps a lot. Thank you for taking the time to respond. Wow is all I can say. You, and your family, put on amazing get together. Such a gorgeous setting and fantastic food. I admire you…You are really ¡¡¡ SOMETHING !!! So beautiful! So much love and work went into all this is so lovely.I love your huge table and I’m sure everyone had a wonderful time together. Oh the dishes but I’m sure it was all worth it. I love your place cards i always want to make them ahead of time but it slips my mind while I’m cooking! Tori, WOW! 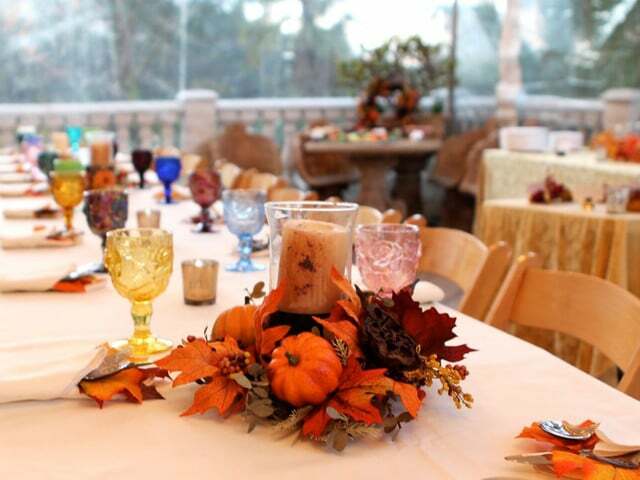 I am so loving those goblets and genius move on the succah decorations and your buffet spread looked delicious – What was that ring of challah thing with dip in the middle? Everything really looked awesome. What a great day to have a Bday – looked like it was a fun one. What a beautiful spread! Everything on your menu sounds delicious! Looks delicious. I thought because of it being “shiksa” in the kitchen, there surely would have been ham. But instead, there was hummus. Go figure. What an amazing Thanksgiving! Your 30 guests are lucky! Your table and food looks amazing. Happy Thanksgiving! Happy Thanksgiving and Happy Birthday Tori! I did not take one picture of my Thanksgiving food….too busy cooking! You table and buffet look wonderful! You left off the Moroccan Carrots from your menu. I see them in the picture! Whoops! Haha sorry about that. Yes, it was a Moroccan Carrot Salad with Harissa. I’ll update the menu. Thanks Jackie! What a fun and delicious dinner! It looks like a good time for all and I can understand not wanting to wait…it looked amazing! Happy Thanksgiving! Oh wow, everything looks so gorgeous and delicious! Not too many nor too few items. Bravo! PS: Champers said thank you for the extra turkey you send.